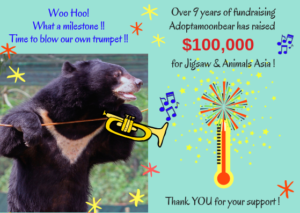 Please join me in caring for our adopted Moon Bear, Jigsaw! 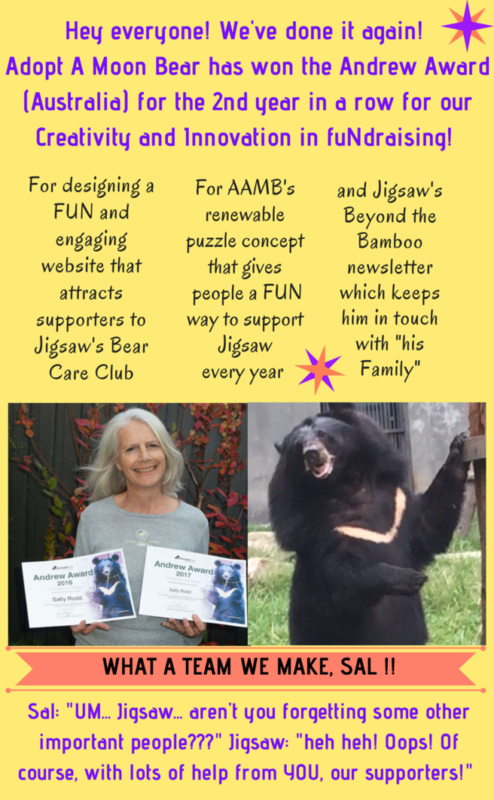 In 1998 Jill Robinson founded the Animals Asia Foundation to rescue and rehabilitate these bears and for many years I have supported its work. 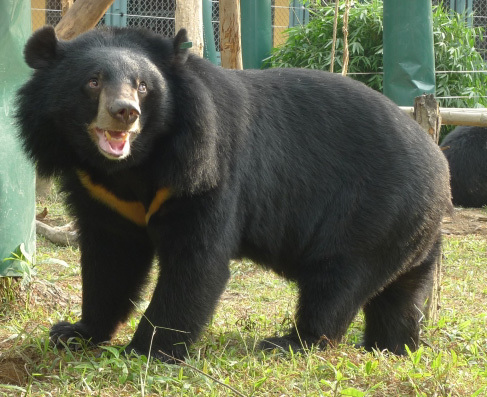 Animals Asia now operates two Moon Bear sanctuaries, one in China and the other in Vietnam. 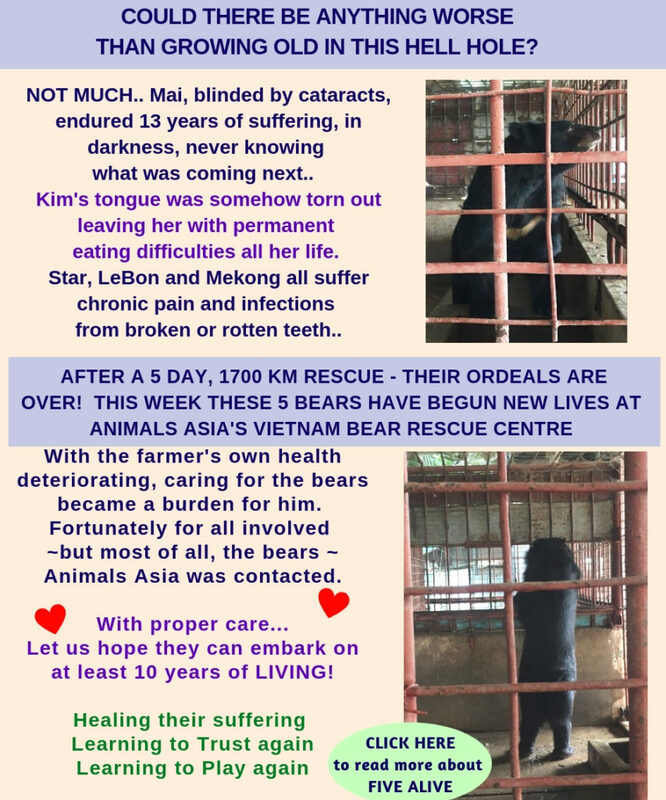 In November 2009 I decided to do something more substantial so I committed to the rescue and ongoing care of one of Animals Asia's bears. I set up Adoptamoonbear.com and, in just over twelve months, with the help of many people like you, raised the required $14,500 to assist Animals Asia rescue and begin the rehabilitation of a lovely young male bear in Vietnam. Today Jigsaw is enjoying his new life at Animals Asia's bear sanctuary situated in the Tam Dao National Park, a few hours from Hanoi, Vietnam, free from the pain and suffering of his past! 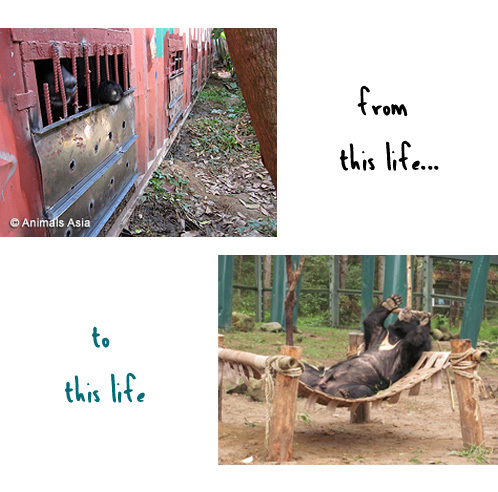 When Animals Asia rescues a bear, it commits to the bear's care for the term of its natural life. Our continued sponsorship supports Animals Asia in honouring this commitment to our cheeky, fun-loving Jigsaw. Join me now and help give Jigsaw the healthy, happy life he deserves. If you who are new to this website and wondering....why the name “Jigsaw” ?? Hi everyone! Such good news to tell you! My puzzle is finished for 2018 – thank you to everyone who has donated this year. On the way we rocketed past a massive fuNraising total of $100,000 over 9 years!! I’m still pinching myself – never in my wildest dreams did I think I would raise this sort of money. THANK YOU TO EVERYONE who has donated over the years and helped us reach this extraordinary milestone!!! 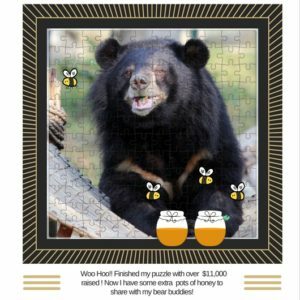 Our 200th bear rescued and my 2018 puzzle almost finished! Very exciting news here in Vietnam with the 200th bear rescued by Animals Asia! Remember, I was the 39th bear rescued in 2010 so we’ve come a long way since then. And the most important news is that the Vietnam Government has decreed that it will be illegal for people to own bears by 2022! Yeah! Meanwhile I’m SUPER excited because my 2018 puzzle is almost finished – only TEN pieces to go!! Woo Hoo!! Will you help me finish it! 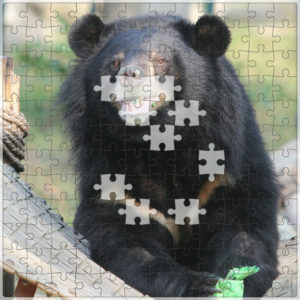 discuss Comments Off on Our 200th bear rescued and my 2018 puzzle almost finished! Spring is here and so are more bears! Hi Everyone! It’s a Big Year ! Not only have more bears been rescued but Animals Asia is celebrating its 20th Anniversary! And….. we are well on the way to reaching a MASSIVE fuN-raising total for Jigsaw of $100,000 in only 9 years!! discuss Comments Off on Spring is here and so are more bears! Adoptamoonbear wins one of Animals Asia’s awards for fuNraising! the Andrew Award for Innovation and Creativity in fundraising – for the second year in a row! This is also the 20th Anniversary of Animals Asia which was founded in 1998 and since then has rescued and cared for 600 bears. We are also halfway through Jigsaw’s 2018 puzzle. discuss Comments Off on Adoptamoonbear wins one of Animals Asia’s awards for fuNraising! Woo Hoo! We’re all finished! Thank you everyone for your support! But if you’re thinking “Bother, I missed out…” then don’t worry!!! You can still donate a pot of honey!! It was so coooool this year because the final pieces were donated on the same day as the anniversary (Dec 14 2010) of raising the initial money to rescue me!! Jigsaw’s puzzle is romping home for Christmas! Well we’ve nearly done it! And if you don’t get in soon, you will miss out on a piece of my 2017 puzzle. When we finish it, we will have raised almost $11,000 towards my Bear Care Club this year !!!! Woo Hoo!!!! And if you would like to read my December 2017 newsletter, click here! 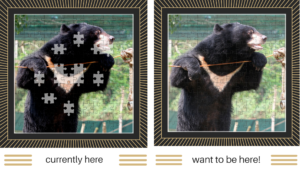 Jigsaw had a whole lot of fun asking bears at the sanctuary the keys to being Happy Bears…. and do you know what…. the answers are pretty simple…. and probably the same as what makes you and me happy, too! But if you just want to DONATE NOW so you DON”T MISS OUT, then click here! discuss No Comments on Jigsaw’s puzzle is romping home for Christmas!